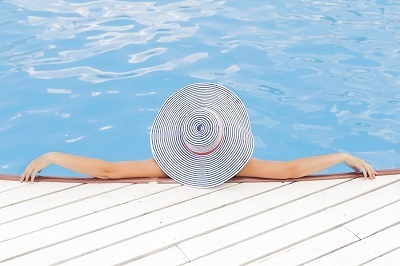 Alright, all of you pool people out there, do you agree with the following statement? While pools can be considered the ultimate luxury outdoor living space, the pool itself cannot carry the whole space. A patio or deck, a place to cook, a place to eat, a place to sit and watch the swimmers or sit and gaze into the shimmering water while the sun dances on its surface … All of these elements work together with a beautiful pool to create a deluxe outdoor living space. The pool does not stand alone. 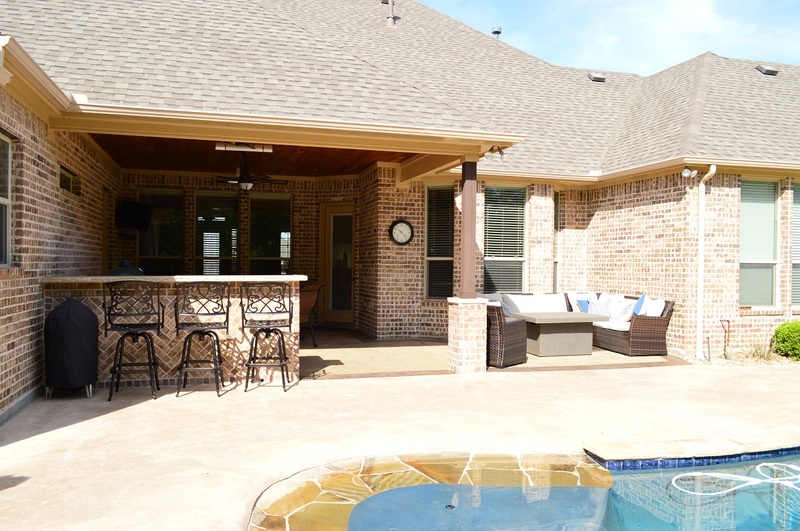 We recently completed two projects in the Northeast Dallas area where we were able to provide the perfect poolside accommodations, one a deck and the other a stain-and-stamp concrete patio, and both with outdoor kitchens. Both projects turned out to be fabulous, and we would like to share the details with you. 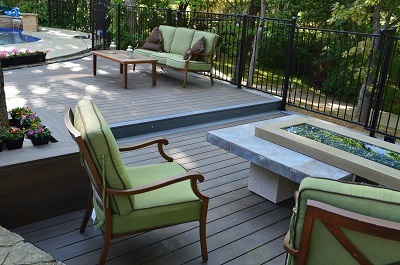 For the bi-level deck we used Fortress low-maintenance composite decking with a picture- frame border. 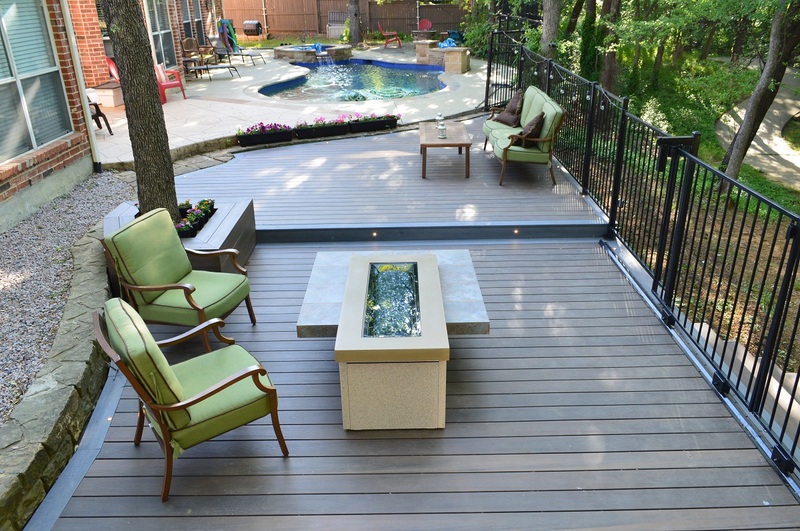 These Fortress decking boards are capped on all four sides to protect against mold and moisture—the perfect material for a poolside deck. The decking is also resistant to scratches, stains and warping. The homeowners chose the Tiger Cove color for the field of the deck and Capetown Gray for the deck’s border, an appealing contrast. We were able to integrate a tree into the deck design, and the seating wall we built around that tree also serves as a planter. 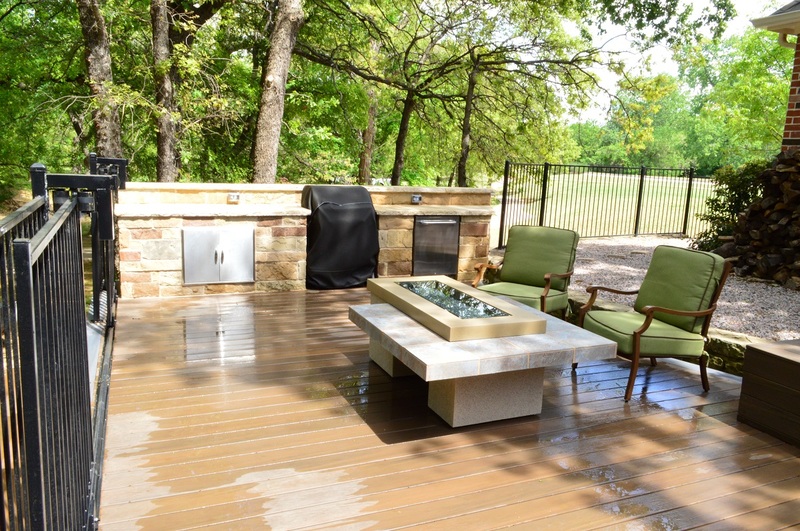 We designed one end of the deck as an outdoor kitchen built with chopped Oklahoma stone. Don’t you love that 8" stone backsplash? We left a space in the outdoor kitchen specifically for the homeowners’ grill. 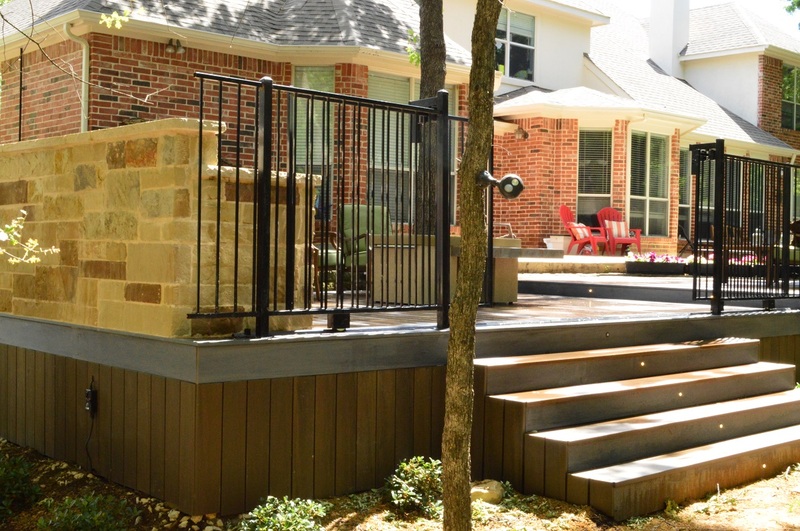 Additional details to look for in the deck design include the solid board skirting that conceals the underside of the deck, integrated deck lighting on the stair risers and the black wrought iron sliding gate at the top of the deck stairs. We custom-installed this gate to match the homeowner-installed gate around the pool area. The under-deck area, used as dry storage, provides access to the gas line for the outdoor kitchen and the electrical wiring for the deck lighting. This deluxe outdoor living project also included a softscape component. Along the side of the deck we installed Indian Hawthorn shrubs and Jasmine, both of which will produce flowers and attract pollinators. Finally, please take a moment to admire the homeowners’ amazing uptown fire table! The homeowners wanted to update the patio floor with stain and stamp concrete. They selected a bone and walnut color for the stain, a Roman slate pattern for the stamp and a darker walnut stain to create a patio border. 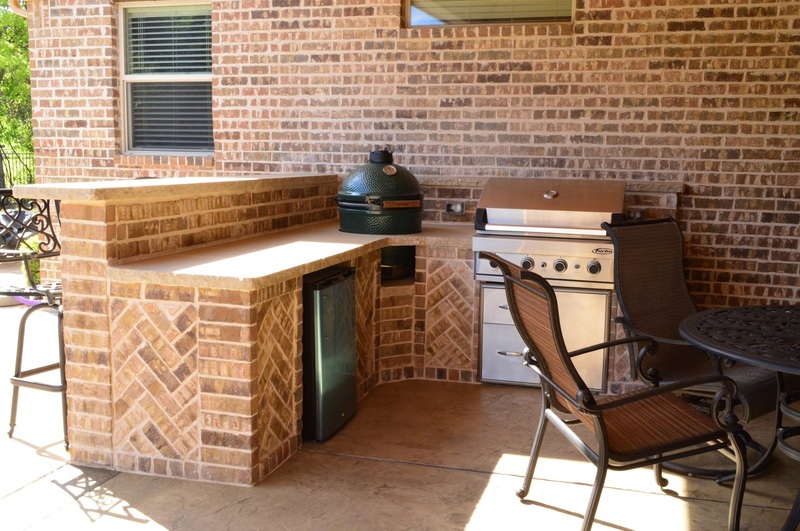 For the outdoor kitchen addition, we were able to match the brick that was used in building the home. Don’t you love the brick herringbone pattern we used in the kitchen design? You can tell we custom-design each of our outdoor living projects, because this outdoor kitchen design is unique! 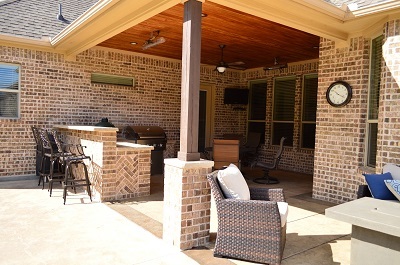 The outdoor kitchen includes a grill, a Big Green Egg smoker and a refrigerator. The counters are made of smooth Lueders stone in chocolate. Don’t forget to look up! 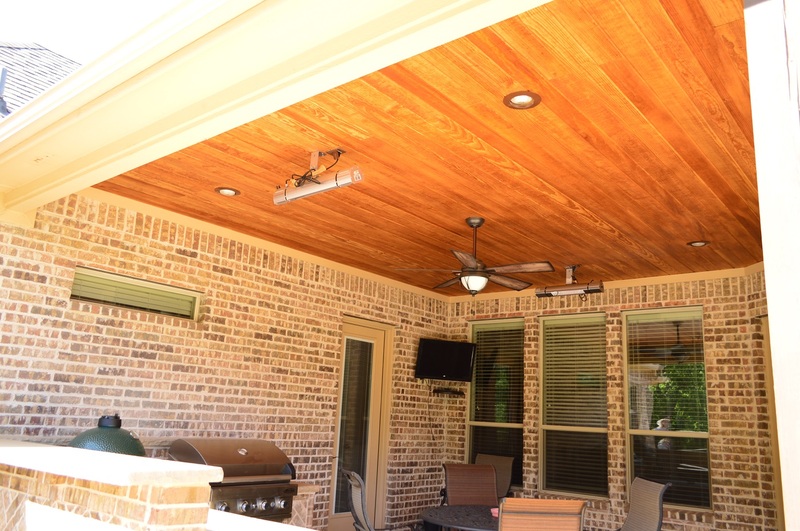 We updated the patio ceiling as well, removing the original HardiePlank ceiling and replacing it with a beautiful tongue-and-groove pine ceiling. Both of these families, one in Southlake and one in Keller, TX, are thrilled with their new, deluxe outdoor living spaces. Having ample room to relax near the pool with a stylish and super-functional outdoor kitchen sets their summer off to a great start. — Before & after of Southlake project. — Before & after of Keller project. 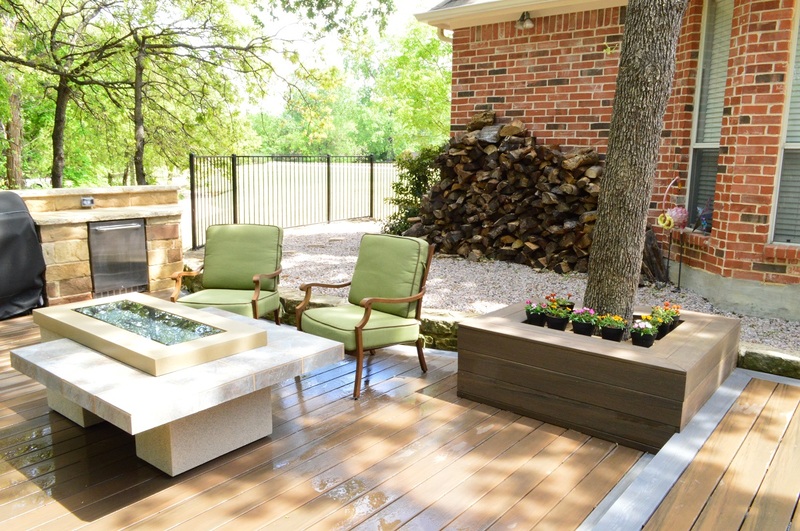 If you’re interested in a Dallas outdoor kitchen as part of your outdoor living space, we can work with you to design the space you desire. 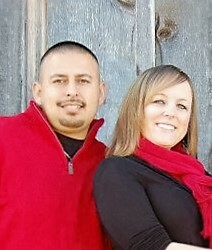 Contact Archadeck of Northeast Dallas-Southlake today at (972) 904 – 3325 or email [email protected].